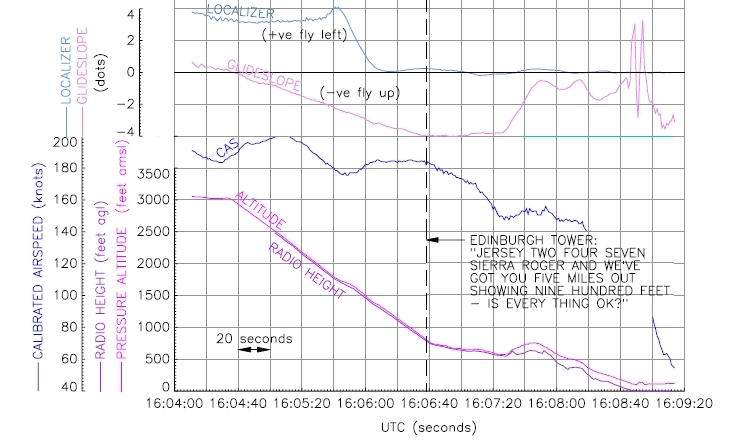 An investigation into a serious incident involving a DHC-8-400 on approach to Edinburgh Airport, UK revealed that Flight Director mode confusion led to a descent to within 800 ft of local terrain approximately 5 nm from the runway threshold. On December 23, 2008 a de Havilland Canada DHC-8-402Q Dash 8, registered G-JECI, was being operated on a scheduled passenger service from Southampton to Edinburgh as BEE247S. As it commenced its final approach to runway 24 at Edinburgh the approach controller (APC) instructed the aircraft to turn onto a heading of 280° to intercept the ILS localiser, descend from 3,000 ft to 2,100 ft and maintain a speed of at least 160 kt until 4 nm from touchdown. During the descent the aircraft accelerated to approximately 200 kt with flap and landing gear up. The aircraft did not level off as intended at 2,100 ft but continued to descend at a constant vertical speed such that it remained at all times below the ILS glideslope. At an altitude of approximately 1,800 ft, apparently without having noticed that the aircraft had descended below the cleared altitude before intercepting the ILS, the APC instructed the pilots to contact the aerodrome controller (ADC). At about this time Flap 5 was selected and the aircraft decelerated to approximately 180 kt. The ground movement controller (GMC), who sat beside the ADC in the visual control room (VCR), saw the aircraft when it was approximately 5 nm from touchdown and noticed that it looked “substantially below the glidepath”. He mentioned this to the ADC. When shortly afterwards the co-pilot called, “tower jersey two four seven sierra is five and a half miles two four”, the ADC responded “jersey two four seven sierra roger and we’ve got you five miles out showing nine hundred feet is everything ok”. The co-pilot replied “err affirm jersey two four seven sierra”. Not content with the response the ADC replied “jersey two four seven sierra how low are you planning on descending at the moment”. The co-pilot responded “err we’re gonna level now actually our glideslope capture obviously failed jersey two four seven sierra”. The controllers in the VCR saw the aircraft climb slightly and continue an apparently normal approach. Attempting to regain the correct flight path manually, the commander initially experienced some difficulty disconnecting the autopilot and found that the aircraft tended to adopt a pitch attitude 8° below the horizon. When able to resume full control, at approximately 700 ft agl, he called for Flap 15 and landing gear down. The landing was completed without further incident. A similar incident occurred on 8 May 2009 involving a DHC-8-400 on approach to Glasgow Airport. Both incidents appear to have been initiated by Flight Guidance Control Panel (FGCP) selections which resulted in Flight Director modes other than those intended by the pilots. In the case of G-JECI, recorded data indicates that the altitude select mode was not armed after selection of a lower altitude. This problem would be alleviated if the altitude select mode was automatic upon selection of a new altitude and vertical mode, as is the case on several other aircraft types and as envisaged by the aircraft manufacturer in its discussions with operators. It is recommended that Bombardier Aerospace enable automatic arming of the altitude select mode of the flight director fitted to Dash-8-400 series aircraft upon selection of a new altitude and vertical mode. It is recommended that Flybe consider amending its standard operating procedures to require an altitude check whilst on final approach even when the pilots are in visual contact with the runway.